Toughening its rules of engagement, Israel on Thursday bombed the apartment of a Hamas leader, killing him, his four wives and 11 of his children. Planes also attacked five mosques that allegedly serve as both rocket storage areas and Hamas command posts. As it entered the seventh day of warfare in the Gaza Strip, Israel indicated that efforts to avoid civilian casualties were being eased in order to get at Hamas targets. “The Israel Defense Forces will continue to attack any target used for terrorist activity and will not hesitate to strike those involved in terrorism, even if they choose to operate from locations of religious or cultural significance,” said in a statement issued by the army spokesman's office. Israeli ground forces remain poised around Gaza, with officials indicating that an attack was imminent. The assassinated Hamas leader, Nizar Ghayan, had chosen not to go underground as have almost all his colleagues. According to Israeli officials, he had surrounded himself with family and aides in the belief that Israel would not attack civilians. In order to reduce civilian casualties, Israeli intelligence officers have been telephoning residents in targeted buildings to warn them to get out in 10 minutes, or dropping leaflets with similar warnings. In some cases, residents have gone up to the roof to show themselves to circling aircraft and succeeded in preventing the attack. The air force, in turn, has adopted what it calls “roof knocking”, as distinct from door knocking, whereby planes or helicopters fire at an unoccupied corner of the roof, which usually persuades the residents to vacate the building. In Ghayan's case, reported Israel Radio, he insisted on remaining in his apartment despite warnings on the assumption that his human shield would protect him. A son who was not home at the time said his father did not imagine that Israel would attack a home with a family inside. A commentator on Israel Radio replied that Hamas rockets fired at Israeli towns do precisely that. Ghayan was the first senior Hamas official to be assassinated since the operation began last Saturday. The others remain hidden. Hamas leaders warn of retaliation for Ghayan's assassination “against Zionist interests everywhere”. It was not clear whether this included attacks on targets overseas, something which Hamas has so far refrained from. In addition to the attack on Ghayan, an Israeli spokesman said the homes of 15 other Hamas leaders were attacked during the night. One of the targeted men was reported killed. The spokesman said targeted assassinations would be stepped up. In the attacks on the mosques secondary explosions were reported, attesting to the presence of rockets, a military spokesman said. Also hit were rocket launchers, tunnels and arms stores. 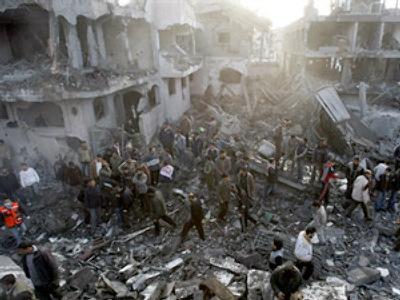 Egypt has requested Israel to refrain from attacks on mosques in order not to further stir emotions in the Arab world. Despite the ongoing Israeli air attacks, Hamas managed to fire 60 rockets into Israel on Thursday, including several which struck open areas around Beersheba, more than 30 kilometers distance away. There were no casualties. Civil defense officials urged worshippers within range of Gaza to hold Sabbath services today in shelters. Inside Israel, police were braced for violent demonstrations against the Gaza attack after Friday mosque prayers. More than 300 Israeli Arabs who participated in such demonstrations during the week have been detained.